After my Nun’s Letterbraid tutorial, I really didn’t plan on posting any more how-to’s on pick-up patterning in loop braids… But Gary is just about forcing me to do it! A few weeks ago, when I was working on the Triangle Braid tutorial, Gary Mitchell of the FingerTips site emailed me that he was developing an online interactive pick-up pattern planner for ‘Doug’s Braid’*! Doug’s Braid is a very “do-able” braid. No thumbs, no doubled loops, similar moves to the 7-loop Spanish braid, and a very unusual and great-looking braid (rounded/ squarish, but twice as intricate as a Square braid). Having an interactive pick-up pattern planner available for it will make pick-up patterning very doable, as well! Pick-up patterns are motifs and patterns that may require different moves from one row of braiding to another. Up to now, I’ve only talked about ‘complementary pick-up patterning’ in my posts on Letter braids. Letter Braids are extremely complicated braids for a solo braider, so you probably filed the topic away as “cool, but impossible,” and didn’t think much more about it. 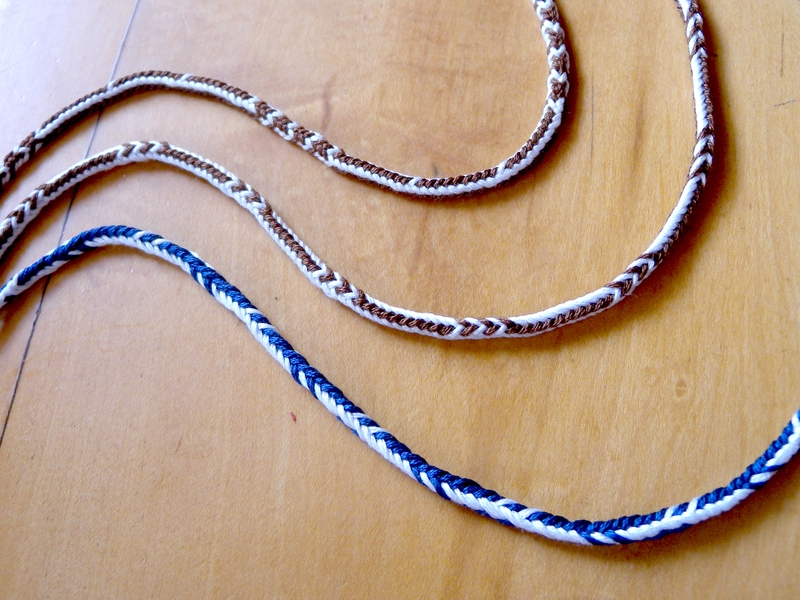 But pick-up patterning can be done in any two-layer loop braid! I’m talking: Square braids, Spanish braids, Doug’s braid, Double braids, Letterbraids. In fact, if you’ve used bicolor loops for any of these braids, you’ve already used pick-up patterning with realizing it! Your regular braiding moves automatically produce a pick-up pattern when you use bicolor loops in a two-layer braid! Each time you turn a bicolor loop while transferring it, that loop’s two colors switch places between the upper and lower layers of the braid. The color from the lower layer of the braid is brought UP, while the opposite color from the upper layer is dropped DOWN. That is the essence of ‘complementary pick-up patterning’ in both braiding and weaving. The top and bottom layers of the finished fabric have the same pattern, but with the two colors reversed. While braiding with bicolor loops and creating an ‘automatic’ pick-up pattern, the braider just repeats the same exact pick-up sequence in each row. So, row-by-row charts of the pick-up moves aren’t really necessary (though they do make it much easier to switch between patterns within one braid!). Instead of turning loops automatically, you can also selectively turn or not turn the transferring loops in each row of braiding, to produce a bicolor pattern that does not have the exact same sequence of turned loops in each row. This is what the term pick-up usually implies, at least to me. By “selectively” I don’t mean you make it up on the spot! More likely you’ll be following a set of instructions that you or someone else made up previously, and selecting which loops to turn and which not to turn based on those instructions. If the motif or pattern is a simple one – like the ones in the photo below – you can probably memorize the instructions fairly quickly, and/ or “read” the previously braided area rather than keep reading the instructions. Three 5-loop braids with pick-up patterns. Even though these patterns are fairly simple, the sequence of turned and not-turned loops (reversed and unreversed) is not the same in every row of braiding. Each of these color-patterns does have a regularly repeating sequence of turned and straight loop transfers, but it is much longer than one row. A pick-up chart is a simple, visual way to display the instructions for each row of a pattern or motif. Instead of listing start-of-braiding loop set-up positions, and a lot of confusing text about which loops to turn and which not to turn in each row of braiding, a pick-up chart simply shows “DARK” or “LIGHT” for the loop transfers of each row of braiding. The two cells in the row stand for the left and right loop transfer in one row of braiding a square braid. 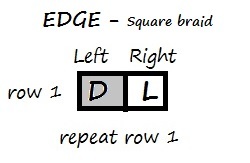 A braid with 4 loop transfers in each row, like Doug’s Braid, Double Braids, etc, would have 4 cells for DARK or LIGHT across each row of the chart. That DARK or LIGHT tells the braider which shank of the bicolor loop should finish in upper position on the finger (after the transfer is done). The chart will work no matter what order of darks and lights you start out with! Before braiding a ‘row’ (one repetition of the left and right braiding moves), you check that row in the chart and see that the left loop transfer should finish ‘DARK up’. You then approach the loop transfer while thinking: “Dark up!” If you see that the transferring loop’s dark shank is already up – no turn! But if its light shank is up – turn it! Note: in one row, the left “Dark” might require turning the loop, whereas in the following row, that same left “Dark” might require NOT turning the loop, depending on how the loops are being held – this is especially the case at the beginning of braiding, or when switching between two different color-patterns. Eventually you’ll probably be able to remember the instructions for both transfers of a row, so you’re more likely to be thinking “DARK up! – LIGHT up!” while making the following two loop transfers, before checking the chart again. With Edge pattern, all there is is one charted row, so you’ve already memorized the whole chart! With the exception of Edge Pattern, the charts for automatic patterns usually have the same number of rows as the number of loops in the braid, so 5 rows for a 5-loop pattern, 7 rows for a 7-loop pattern and so forth. For a non-automatic/ true pick-up pattern, the chart might be any number of rows. A square braid only has only two columns of slanted thread passages across the top (and bottom) surface of the braid. On graph paper that would be like planning a dark-light pattern using only two adjacent columns of squares. 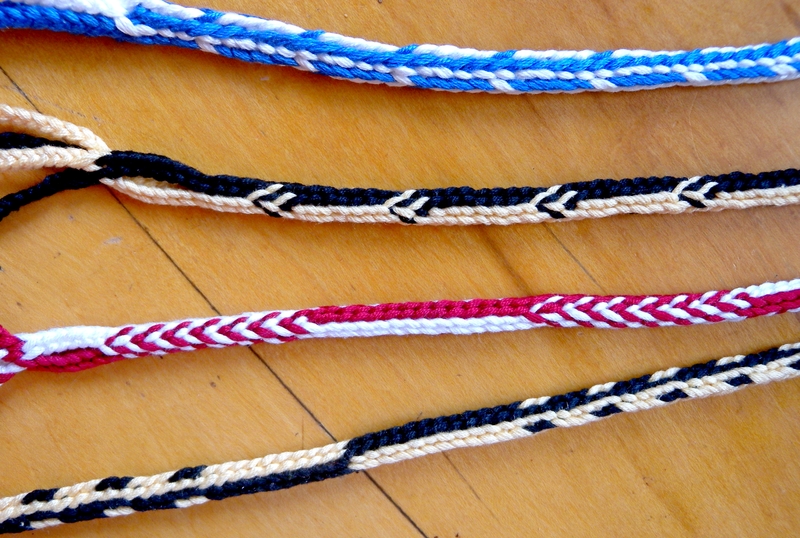 So a square braid’s bicolor patterns – both “automatic” and “real” pick-up – are much simpler than those of the letterbraids (8 columns) or Spanish and Double braids (4 columns). 7-loop Square braid with pick-up patterns, showing the two ‘columns’ of the lower surface of the braid. Of course, in real-braid-life, a square braid looks more complex than just two columns of graph paper! When you look at a square braid, you usually see more than just one side of the braid. The opposite color pattern of the second layer of the braid comes into view as well, adding both depth and pattern complexity. At the other extreme, letter-braids have eight columns across the braid to plan color changes in. To a weaver, that might not seem like much, but it’s enough to plan any letter of the alphabet (sideways), as well as other fairly complex-looking designs. Remember, there’s no real limit to the length / number of rows in a braid’s pick-up pattern, only to its width. In between square braids and letterbraids are Doug’s braid, the 7-loop Spanish braid, and Double braids — all of them two-layer braids having 4 columns across for dark-light choices! With 4 columns – and essentially an infinite number of rows – it becomes possible to design some quite distinctive patterns. 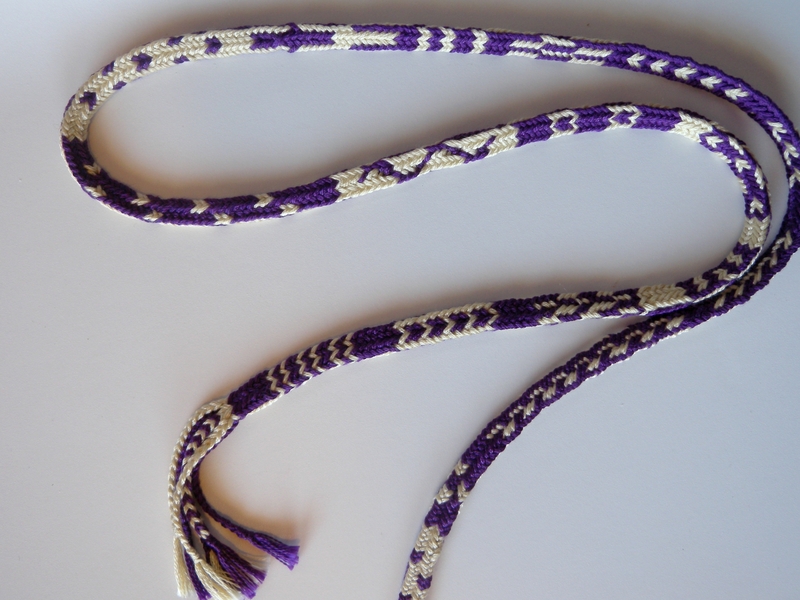 You can also make small simple motifs, and separate them along the braid with long dark or light areas. This is a very different “look” from most braid patterns. The average braid doesn’t have long non-repeating areas. 10-loop Double braid pickup pattern sampler. Square braids are minimal enough that it’s possible to design pickup patterns for them “on the fly”. Remembering them is another issue! Jotting down the darks and lights in chart form can be a great way to note down a nice square braid pattern. Double braids, Spanish braids, Doug’s Braid pick-up patterns can also be designed by “trial-and-see-how-you-like-it”, but they are a little trickier to remember and jot down into chart form. And conversely, designing a charted pattern “on the chart” can be sort of like making a mosaic in the dark! It might turn out great as a braid, but is unlikely to look the way you imagined. Unfortunately, the more complex the braid, the harder/ less intuitive it can be to plan designs for it, even in chart form. Even so simple a chart as the one-row chart for the square braid Edge Pattern doesn’t look exactly like the way the braid turns out. This chart for making Edge has a DARK cell on the left, and a LIGHT cell on the right. If you braid according to this chart, however, the right column of the braid will be dark and the left column will be light – the exact opposite of what you probably expected from looking at the chart. While it’s very possible to find great pick-up designs just by experimenting a bit, you can get a lot further a lot faster with a tiny bit of technology! An interactive pick-up planner like the one Gary is making for Doug’s Braid is invaluable, because it will show both a pick-up chart of the DARK/ LIGHT moves that the braider must follow, and also a tiled representation of how that dark/light pattern will look in the braid – much better than graph paper, because the tiles slant like the actual thread passages in a braid. You ‘draw’ on the tiled braid image by clicking on tiles to color them in, while simultaneously, the pick-up chart updates to show how to create the pattern! Ok, that’s it for this intro post on Pick-up patterning in loop braiding. Update: Part 2 is here! Learn how to do pick-up in a square braid! *Doug’s Braid is a 7-loop round “Spanish” braid with an odd twist, invented by Douglas Grant. Its world introduction was here on my blog back in 2012 – I put up two tutorials for it and for several possible color patterns: Part I (text tutorial and instructions for several color patterns), and Part II (the video tutorial, and one more color-pattern). Before Gary’s recent email, it had never even occurred to me to do pick-up patterning with Doug’s braid! – I guess because I think of it as round in shape rather than 2-layer. But structurally it really is a two-layer braid, so of course can be made with pick-up patterning. Loops are only turned while being transferred through another loop or loops. So a color change from turning a bicolor loop will not actually show in the place where it was turned, because at that point in the braid, the newly turned loop is covered/ encased by the loop or loops it passes through. On each layer of the braid, each strand of the transferring loop is going “under 1” or “under 2” etc, depending on whether the structure is plain weave or twill. The newly-swapped colors only become visible in a subsequent “stitch” – when that loop itself becomes an “around” loop, after another loop is passed through it. The move revealing the color-change might occur within the same row of braiding, but in some braids it might not happen until the following row of braiding moves. That subsequent stitch (where the color change actually shows up) may also seem very displaced to one side or the other from the point where you turned the loop. Braiding strands travel steeply diagonally across the braid, and at cross purposes to each other, they don’t stay in straight vertical columns like the picked-up strands in a weaving. Both criss-crossing diagonal courses in a braid can have color-changes. In a (warp-faced) weaving, it’s only the vertical course – the warp strands – that are picked up, so the color-changes stay neatly in place relative to each other. The worked rows may not be straight across in the braid the way they look in a pickup chart. In fact, horizontal “rows” are not a physical reality in a braid, really. The strands in a braid all travel diagonally. In a pick-up chart, a horizontal row simply represents one repetition of the braiding moves, which do not necessarily follow the whole path of one single strand or loop across the braid. The interlacing movements that the braider performs may proceed diagonally or horizontally (or a mix of both) across the braid. I gather that in Kumihimo braiding on a takadai (a kind of Japanese braiding table), one working row of braiding follows the steep diagonal paths of 2 opposite braiding strands halfway across the braid: from the left and right edges of the braid down to the center of the braid. This is not always the case in loop braiding, other than for very simple braids like square braids. In another braiding strategy for making the same exact braid, a row of work (the braiding moves) might proceed more-or-less horizontally across the braid — in more than one possible path. The same overs and unders can be created either way. The steep diagonal path of each individual strand would still end up being the same, but a strand on the edge would not go all the way to the center of the braid within a single row/repetition of the braiding moves – it would take two to several rows. In any of these strategies, one strand leaves the edge, and one strand reaches the center of the braid in each row of work, however, it isn’t necessarily the same strand. This explains why a row of color changes that looks straight across on a pickup chart might not look straight across in the braid. It also explains why a pick-up chart for a specific braid pattern might only work for ONE method of making that braid. While the exact same braid (and color pattern) could be made with possibly several other strategies/ order of braiding moves, those other strategies would require different pickup charts for the same pattern. So you really can’t tell just by looking at a braid exactly which overs and unders were made in one row of work! The same exact braid can often be made with quite differently shaped working rows (what Joy Boutrup refers to as fells). 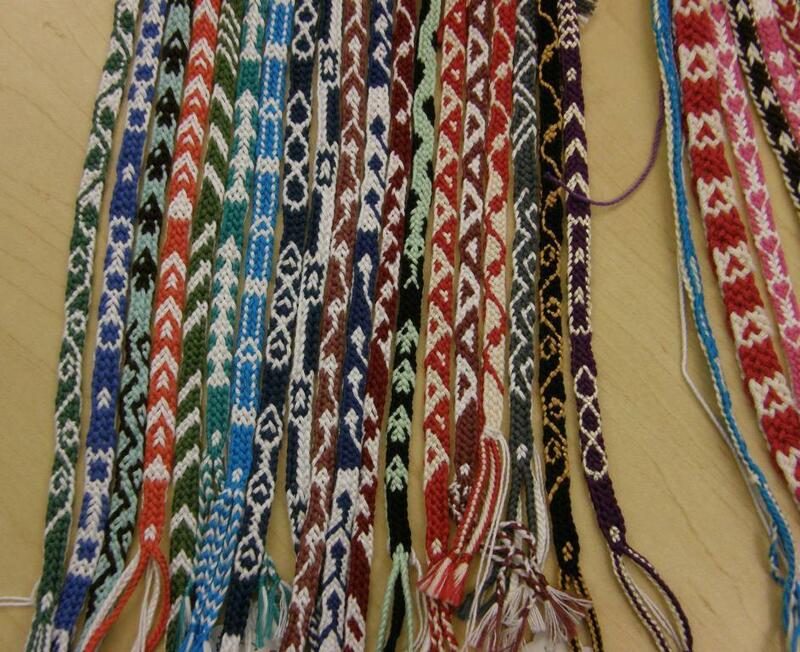 Two “stitches” that appear to be horizontally side-by-side may have been made in the same row of braiding, or not. Depending on how the braid was made, specific color changes for the exact same design in the exact same (resulting) braid could be done in quite different rows of work, and so require very different charts. Planning a charted design is quite dependent on the particular order of braiding moves being used, as the order of the moves is what “shapes” the working rows. For example, on this blog (in another post) I taught double braids with a certain order of moves for the 4 loop transfers of one row/cycle of braiding. A braider can easily make the same braid by doing those moves in another order, in fact I sometimes do them in another order than the one I taught. Update: Part 2 is here! Learn how to do pick-up in a square loop braid! September 13, 2017 in Pick-up patterns, Tips. I did not know this existed! Yay WordPress! Hi Connie, I’d love to see your takadai pickup braids! I was thinking of this post more as background for some pick-up tutorials, the tutorials will be coming soon (I hope)! You are amazing Ingrid! I’m proud to know you! aaaaw! thanks, CR you are so sweet! Thanks for your enthusiasm, and yay for retirement!